Pope John XXIII Central Catholic is recipient of a Monsanto grant. In a press release from Monsanto, it is announced that a second group associated with Elgin receives a generous donation! Since 2010, the America’s Farmers Grow Communities program has given more than $26 million to more than 8,000 nonprofits across rural America. 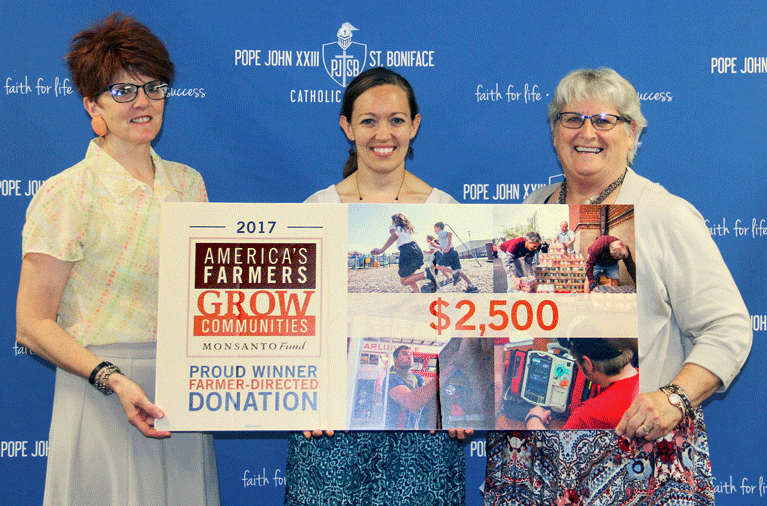 ELGIN, NE (May 16, 2017) – An anonymous Antelope County farmer has won the opportunity to direct a $2,500 dollar donation from the America’s Farmers Grow Communities program, sponsored by the Monsanto Fund, to Pope John XXIII Central Catholic High School. Pope John will use the funds to improve their fine arts programs offered by the school. The musical department, led by instructor Rachel Becker will be able to purchase a much needed drum set for the Pope John band, along with some audio equipment for the annual musical production. The One-Act team, led by instructor Peggy Payne will be able to purchase a portable spotlight and performance boxes for students. “The arts are such an important foundation to an education at Pope John, we are grateful to Monsanto and our anonymous donor.” said, Betty Getzfred, Administrator at Pope John XXIII Central Catholic. The Grow Communities program’s purpose is to make a positive impact in farm communities by partnering with farmers to support the causes that are important to them in their communities. Each year, farmers enter for a chance to win a $2,500 donation that they direct to a local nonprofit. For more information or to see a complete list of the 2017 America’s Farmers Grow Communities recipients, visit www.GrowCommunities.com. Earlier this spring, Elgin Rescue received a similar grant.